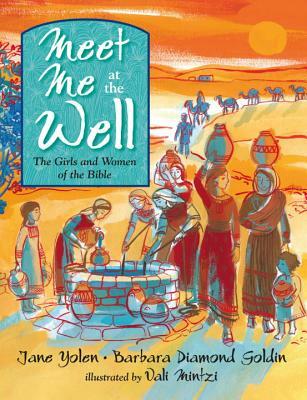 Meet Me at the Well: The Girls and Women of the Bible (Hardcover) | novel. Old Testament stories center around men. Leaders, prophets, kings, and priests are all male. But hidden in the background are strong-willed, daring females. Jane Yolen and Barbara Diamond Goldin's masterful retellings pairs eloquent profiles with stunning art, answering one question: What makes these women heroes? From first woman, Eve, to Deborah the judge, to Queen Esther, savior of her people, females in the Hebrew bible are resourceful and courageous. Each chapter is devoted to a single story with text complemented by sidebars, known in Jewish tradition as "midrashim," that pose questions, provide more information, and include nondenominational interpretations. * Jane Yolen is the award-winning author of over three hundred children's books including Last Laughs: Prehistoric Epitaphs and Last Laughs: Animal Epitaphs, Bad Girls (with Heidi E. Y. Stemple); Owl Moon, a Caldecott Medal Winner; the How Do Dinosaurs . . . ? series, and Sea Queens.Jane lives in Western Massachusetts and Scotland. * Barbara Diamond Goldin is the author of many picture books and story collections. She received the prestigious Sydney Taylor Body-of-Work Award in 1997. A former teacher and children's librarian, Barbara is now a library director in Western Massachusetts. Vali Mintzi is an illustrator, graphic designer, and puppet-theater designer. She is the illustrator of The Girl With the Brave Heart: A Tale from Tehran (Barefoot Books) as well as several children's books in Hebrew. She lives in Jerusalem with her architect partner and three daughters. Two award-winning children's-book authors team up for a more modern, feminist take on stories of girls and women in the Hebrew Bible. In biblical times, wells were the centers of social life for teenage girls—where future husbands and thirsty animals might appear and news and gossip are traded. Via 14 stories that range from Eve, the first woman and mother, to Esther, who becomes savior and queen of her people, readers learn about these and other complicated subjects including marriage, motherhood, infertility, widowhood, and inheritance as well as female roles and experiences as judge, prophet, and leader. Each chapter offers a story overview identifying female heroism, as well as annotated sidebars anticipating readers' questions, followed by an "Imagine" segment in the character's voice by Goldin and a poem by Yolen. The authors demystify the concept of midrash—noncanonical exploration of or commentary on a story or text—empowering readers to consider their own searching examinations of the subjects presented. Most of the commentary is from Jewish sources, but some include commonalities with other faiths, particularly Christianity and Islam. While the presentation is a little staid, this book is solid, well-researched, well-organized, and especially appropriate for young people preparing for or celebrating coming-of-age rituals. A much-needed, thoughtful updating of Bible stories about women that functions as both storytelling experience and classic reference tome. Yolen and Goldin have collaborated on a text suitable for students’ first serious foray into Biblical analysis or midrash with a focus on women. (“Still we must never forget that even in the stories about men, there are women.”) Nine chapters discuss a total of 14 women and girls from the Hebrew Bible. A working familiarity with the stories of Eve, Rebecca, Deborah, Esther, etc. is assumed. The opening page of each chapter notes the relevant Biblical verses for reference, but Yolen and Goldin move right into retelling and commentary. Using the Jewish tradition of marginalia, they include sidebars anticipating readers’ questions, such as “So many men in the Bible have more than one wife—why?” They also discuss differing interpretations and additional insights held by Jewish tradition. Drawing connections among all three Abrahamic faiths, Yolen and Goldin often include references to Islamic practice and belief. However, the authors say little about the commonly held Islamic belief that Abraham was prepared to sacrifice his son Ishmael—not Isaac, as in Jewish and Christian tradition. Both authors present a more detailed imagining of the women’s stories at the conclusion of each chapter, Goldin in prose and Yolen in verse. Mintzi’s artwork, done in a variety of blues, oranges, browns, and reds, skillfully communicates the landscapes. VERDICT A solid source of study and reflection for libraries with religious patrons. That women are given the short shrift in the Hebrew Bible is no news, but as Yolen and Golden point out in their introduction, their stories have been more fully explored in Jewish midrash — defined in part as “a Jewish story that explains, clarifies, or elaborates” a Bible passage — and lately from a feminine perspective. The authors delve deeply into history and motivations in this collection of 14 biblical tales that highlight women, young and old, who have been imprinted on Western consciousness. First there is a recounting of the relevant story, with sidebars that explain terms and customs (e.g., the marriage of cousins or problematic issues such as the binding of Isaac). Following are short original works, including poems, that take readers inside the minds of the women. Each chapter features a lovely full-page piece of artwork. This organization, though somewhat clunky, nevertheless makes for an informative book. The authors don’t shy away from difficult subject matters — for instance, Naomi’s instructions to Ruth about enticing their kinsman Boaz. At the conclusion, readers are encouraged to come up with their own midrashim.